In an increasingly competitive global marketplace, few things remain constant. Business leaders who recognize this succeed by adapting quickly to market forces to gain the competitive advantage in their industries. During the more than 40 years former chief executive officer (CEO) Jack Welch spent at General Electric (GE), he focused on reducing inefficiency to gain the competitive advantage. This management strategy has been embraced by many modern-era executives. However, accomplishing that competitive edge may take a wide variety of different approaches by today’s plant managers. Some might subscribe to the “slash and burn” approach to make this quarter’s financials appear strong. Forward-thinking managers might seek out more strategic, long-term answers. Large companies, as well as individual facilities within strong, successful companies, are all faced with unique challenges. The different management styles employed are usually quite apparent. Often, the focus—or lack thereof—is evident at the main gate. The outward appearance of a large manufacturing plant sends a loud message to visitors, employees, and the entire community about just how committed its management is to safeguarding the stakeholders’ value. A refinery manager once lectured his entire staff after a serious incident had occurred in the facility. “We should all consider it a privilege that the neighbors permit us to operate in their backyard, and we should do everything in our power to safeguard that privilege,” he said. The roles of the plant maintenance engineer, operations engineer, and facility energy coordinator are all critical. But often the goals of the maintenance, operations, and engineering groups are not in lock-step with one another because the demands on each group are always changing. The utilities engineer, energy coordinator, and operations supervisor know what the real opportunity cost of not maintaining the equipment in a safe, reliable, and energy-efficient condition would be. These positions greatly influence the bottom-line performance of a profitable plant. Reduced process unit throughput due to boiler or steam-system unreliability directly affects the performance of the entire plant. Facilities’ Energy Intensity performance accounts for 50 to 55 percent of the annual operating expenditures in a typical 160,000-barrel-per-day (b/d) refinery. Every 2 years, the refining industry receives performance data from the latest Solomon Associates’ study. Year after year the data show that, to succeed, an energy management program must be built on a base of solid maintenance practices, and realistic reliability and inspection details. How the various groups work to achieve overall first or second quartile Solomon performance in the areas of energy and maintenance differs from company to company, and also from plant to plant within a specific company. Sound maintenances practices include a “plan, do, check, act” dictum and focus the facility on sustained improvement. Periodic process-unit assessments play a key role in this program. That approach must become part of the culture to ensure results. The ideal maintenance plan is integrated with the energy goal of the facility; it does not include a “find, fix, and move on to the next emergency” way of thinking. Several plants have actually seen their annual Environmental Integrity Index (EII) scores diminish as a result of aggressive energy programs that featured a significant emphasis on insulation and refractory system improvements. The Sunoco refineries in the northeast United States typically demonstrate plant EIIs in the low 80s, which equates to 80 percent of the allotted “standard energy” consumption permitted. That is pacesetter-level performance. Sunoco has a well-supported and quite mature insulation program. Since 1999, when the company began doing unit insulation assessments, Sunoco has allocated more than $6 million in its capital energy and operational expenditure (OPEX) budgets to address insulation system deficiencies. That level of spending does not go unnoticed at individual plants. Senior management has come to expect the 80-percent-plus return on investment (ROI) that a typical insulation upgrade project returns. It is “good” for saving British thermal units (Btus) and dollars. It is “good” for the environment (lower emissions). It is “good” for the plant’s bottom line (profitability). 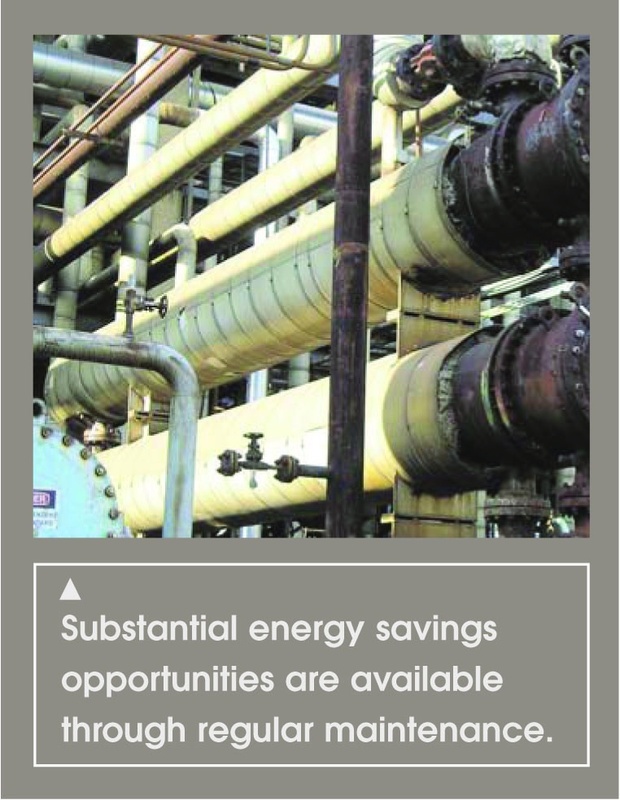 Maintaining a facility’s infrastructure and achieving a pacesetter-level energy program go hand in hand. Too often, maintenance and energy-efficiency goals are not aligned and are even offsetting. The article “Whose Line Is it Anyway?” from the December 2005 issue of Insulation Outlook should be required reading for plant managers and facilities engineers. In it, an example of a rubber plant illustrates much of what is deficient in major industrial facilities. The correlations drawn in the article work for just about any type of manufacturing plant. The ever-increasing energy prices in recent months have been hard to ignore. It is impossible to predict whether oil will ever return to the $25-per-barrel (bbl) level, or whether natural gas will drop below $6 per decatherm (Dth). American industrial concerns are truly being put to a test. They can no longer wait until the government arrives to bail them out of a tight jam. These goals may seem like pie in the sky to many plant supervisors, but they are not. Solomon Associates advises the entire refining industry of what is required to achieve pacesetter-level performance, and each of these areas of focus is within reach for many plants. It does take education and commitment from the whole plant community, including the maintenance area. It also requires a “champion” of sorts to carry the banner forward, especially when money is scarce or other resources are few. Many companies have such a champion, but many more lack that level of commitment. In the National Insulation Association’s (NIA’s) National Insulation Training Program (NITP), it is emphasized that keeping the message clear and concise to management and all of the plant population is the task of a program champion. Insulation may not get the respect it deserves, but it is a simple, cost-effective way to save energy and money. Plant engineers and other facility managers can start by performing a small, focused insulation assessment. There is a good case to be made for installing or maintaining insulation systems at industrial facilities.